What a wonderful setting! 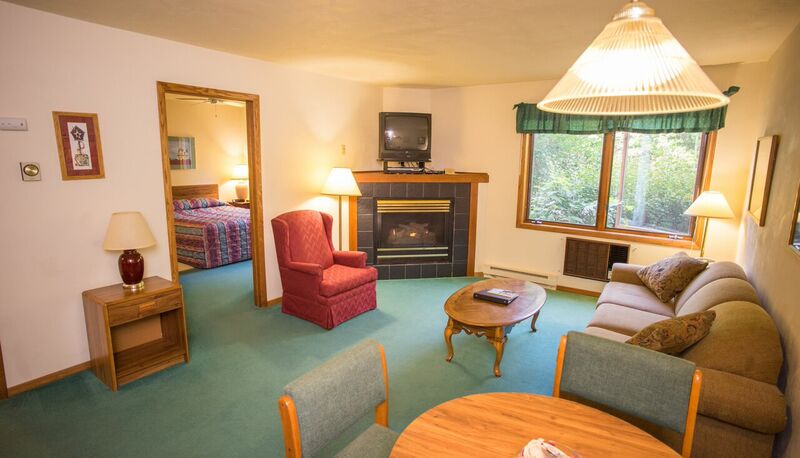 The Somerset Inn & Suites is conveniently located just off Hwy 42 North of Ephraim but at the same time they are nicely “hidden” in a stand of mature, hardwood trees. And in 2014, they updated one wing of the hotel rooms with new paint, carpet, lighting, window treatments, color scheme and more! See the two new room shots below of a single queen and a double queen room. We just spoke with angie, and in 2015, they remodeled five one bedroom deluxe suites with new flooring, paint, lighting, tv’s, bedding, window treatments, etc. Also New in 2015: Somerset now offers ice cream treats and pizza for sale in their lounge, along with free Door County coffee & tea. And there is new furniture in the lounge room too! This place gets better and better! At DoorCountyNavigator.com, we love to see improvements constantly being made to the property. This is a great sign that the owners are improving everything for you, our users. Congrats to Somerset! They also now have some pet-friendly designated rooms as well - so bring the pooch! Pizza, ice cream for sale in lounge, also free Door County Coffee and tea! Note: Angie Meacham and Matt Meacham are the owners of Somerset Inn & Suites in Ephraim as of Spring 2013; however, they definitely are not new to Door County or the hospitality and recreation business. Both Angie and Matt grew up in the Door County tourism business, over 35 years combined experience. And DoorCountyNavigator.com reviewers have met with Angie many times, and they plan to keep up the fine tradition of this wonderful inn. We spoke several times with the property manager and some staff members, and found them to be very eager to please and very delightful. You feel right at home and experience a personal touch that is apparent throughout the property. We found all the rooms and common areas to be clean, well kept and nicely appointed. The entire staff pride themselves in providing sincere, personal service while offering the utmost in quality surroundings and first class amenities. Our experience at The Somerset was great! We viewed the entire property over several different visits and we’re excited when we finally scheduled a time to view the rooms and suites. Read on and we’ll fill you in! We got the opportunity to view three different suite styles and also the hotel style rooms. The property consists of two buildings, a smaller building that houses the main office and eight hotel rooms, and a larger building where a combination of hotel rooms and suites are located. All the rooms we viewed were located in the larger building that also has an indoor pool, whirlpool and large common area. Lots to choose from! The Somerset Inn & Suites has two floors that comprise the accommodations and room 108 is located on the first, or ground floor. This is a hotel style room with two queen beds, nightstand, larger closet with mirrored sliding glass doors, patio, a nice dresser and television. The bathroom is nice size with a full tub/shower unit. The bathroom sink is located outside the bathroom itself making it handy to use while getting ready. To the left as you walk in there is a counter top with a smaller but adequate under-counter fridge, coffee maker, handy ice bucket and microwave. All the hotel style rooms are fully carpeted and have a table with two chairs, kitchenettes, full tub/shower units in the bathrooms, one or two queen size beds and are very spacious. You will find these rooms to be very well appointed, bright & fresh and very affordable. 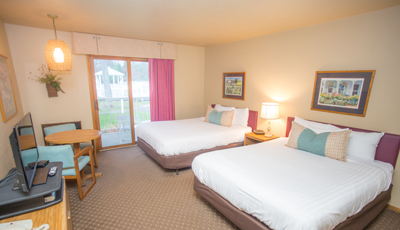 Rates are very reasonable for two adults. Yes! You can stay in Door County for a little more than $100 in peak season, at a great place! (Always check with the innkeeper for current rates and availability). We love to find these affordable gems and let people know about them so if you want a clean, comfortable room with a great price, call the Somerset now! All suites have separate bedrooms and living room areas, fireplaces and kitchenettes. 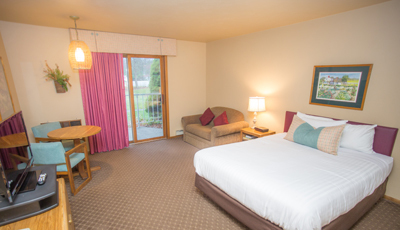 Deluxe suites have one bedroom with aqueen bed, dining area and kitchenette, as well as a living room with fireplace. We found all the suites we viewed to be very roomy, offering ample kitchen amenities and nice appointments. Read on for a description of some of the suites we toured! This suite features a double whirlpool tub in the bedroom. The bedroom itself offers ample space to move around and put your things. It has a ceiling fan, closet, sitting chair, nice mirror, chest of drawers and queen bed. The bathroom in this suite provides handicap bars and easy turn around sink mount. Not all the suites are handicap user friendly so be sure check with the staff while checking in if this is important to you. The main room in this suite has the kitchen at one end, with a table with three chairs situated along the wall that separates the kitchen and living room. The living room has a larger couch, two chairs, coffee table, end table and gas fireplace in the corner. The fireplace is set off with green tile and oak mantel with a smaller TV built in above. This suite has an efficiency kitchen. It is smaller but complete with wash sink, coffee maker, under-counter fridge, microwave that is built in to the cupboards, ice bucket and ample countertop space. Of course, there are mixing bowls, silverware, pots & pans etc. making it easy to fix a quick snack or nice meal of your choice. If you would rather buy groceries while in Door County you can do so just up the road in Sister Bay at a couple of different places. Book this place! This is a luxury suite that features a king size bed and an in-room large double whirlpool tub. This is truly a great suite, one of the nicest we’ve viewed. It’s really set up nice for honeymooners or those of you who deserve a romantic weekend away from the kids. Lots of creature comforts here, from the handy wet bar and kitchen facilities to the stainless steel wine bucket, this room boasts the perfect size with all the necessary comforts you’d expect in a suite of this style. We loved the living room area arrangement. Two large,over-stuffed chairs separated by a stainless steel ice bucket perfect for chilling your favorite wine. Didn’t bring any with?! Not to worry. Choose from a bottle of French champagne or Door County wine, compliments of The Somerset. Sit and relax in front of the fireplace while sipping your wine and enjoy the view out the large bay window. You’ll receive other fine amenities as guests of this suite, including his & hers bathrobes, bath salts and specialty hors d’oeuvres basket. As you would expect, The Somerset Inn & Suites has an indoor pool. It is very nice with vaulted ceilings, white walls that are nicely painted with a white picket fence, potting cart, birdhouses and gazebo. There is also a real gazebo outside near the outdoor pool and of course an indoor Jacuzzi. There is also nice children’s play area and outdoor BBQ gas grill area. The common area located in the center of the main building has a comfortable lounge area situated in front of a stone fireplace. It is very warm, inviting and a handy location for the ever important ice machine (gotta keep the beverages cold!) and soda machine. The Somerset is a well managed resort, and it shows. The grounds are meticulously kept with lots of flowers that border the pathways around the resort. The abundance of mature trees really does lend to the private setting and the location is perfect for day trips to Ephraim and Sister Bay. There are several different room styles to fit everyone’s needs and best of all the prices are reasonable no matter what time of year you choose to visit. You may be happy to know The Somerset maintains a smoke free environment, is open year round and accommodates groups and tours.